This flight was made possible due to my postponed Trigana Air and Kalstar Aviation flights that took place on the 15th March 2014. It didn't take long for me to decide which airline to fly back from CGK. I had thought about flying back to Batam and then catch the ferry back to Singapore but because I had work in the evening, I decided to fly direct instead. The choices were: Air Asia, Jetstar, Tiger, Tiger Mandala, Garuda and Singapore Airlines. I wanted the cheapest option so GA and SQ were out. 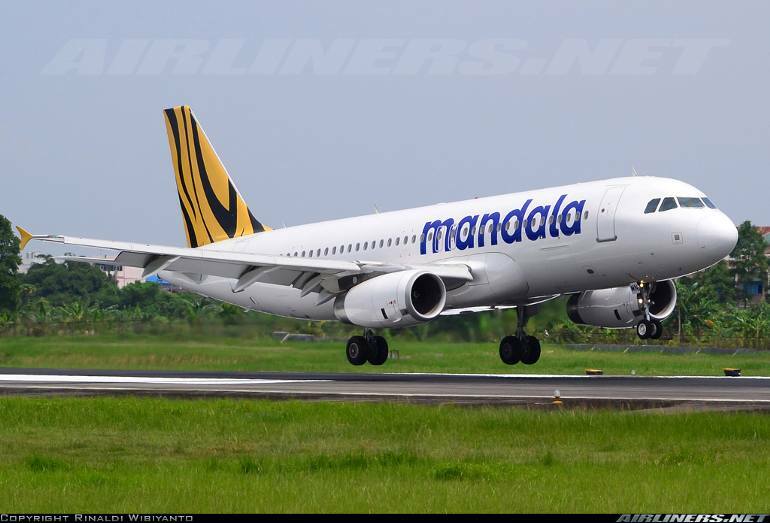 Tiger Mandala was a separate airline from Tiger Airways, so I decided to fly on that and the number of airlines flown so far went up to 58th. 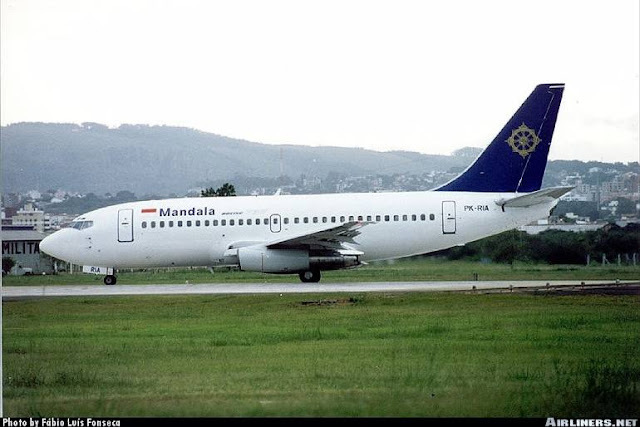 This is in fact the 3rd generation of Mandala. The 2nd generation Mandala was grounded in 2011 and went through some restructuring. The airline managed to resume operation on April 2012, thanks to Saratoga Investment Crop which took 51% and Tiger Airways 33.3% of the shares while the rest were creditors which invested in this airline. 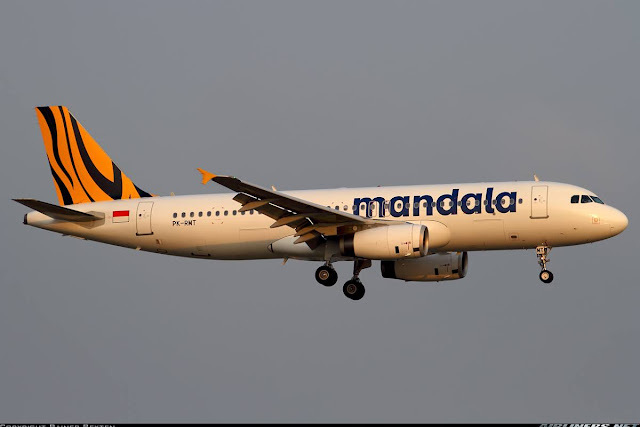 Under the Tigerair group, the airline was renamed to Tiger Mandala; with same tail livery, sharing the sales, marketing channels and distribution. TigerAir group had an order of new A320s which this airline took delivery of 9 aircraft. From what I know a few of them have been returned to the lessor. Currently (At this time of blogging), the airline is making losses and certain routes like KUL-CGK have flights being cancelled very frequently. What's the future of this airline, we all don't know but it looks like it may fail once again. Hopefully not! Tiger Air which may own a 33.3% share in the airline can't do much as the airline themselves are struggling even though they have the backing from one of the most powerful airlines in the world, Singapore Airlines. So it was an easy decision to fly this airline, the only worrying part before the flight was being delayed or cancelled. I had only flown with Tiger Air once before so I would very much prefer to stick to Tiger Mandala for my return flight. Unfortunately, this airline went bankrupt in 2014. On the day itself, I woke up at 6am. Did my online web check-in and then made my way to the airport via hotel taxi. I paid about 60000 Rupiah for the short 10 minutes ride, expensive but I just want to get there asap. More photos can be found on this page. Checking my flight, making sure there was no delay or cancellation. The morning was quite packed, fortunately checking-in was fast and smooth. Not many passengers at the Tiger Air counter, it took about 5 minutes to get my boarding pass. No one at the domestic side, that's very strange. Once that was done, I went to Starbucks to enjoy some coffee. The things in Indonesia are much cheaper than in Singapore, so Singaporeans like to come to either here or Malaysia to shop or relax. Spotting is possible at Terminal 3. My bus that would take us to our aircraft, PK-RMN. The bus took us to our aircraft and since my seat was at the rear, I entered the aircraft from the rear. Once on board, the crew welcome me on board half-heartedly. Not a good start, that's for sure and I made my way to my seat, the last row of the aircraft! Fortunately for me, I had the whole row for myself as other rows were mostly occupied. Very tight legroom space, similar to Trigana and Kalstar's. Luckily my row was empty, and I was able to stretched my legs. Later on, a couple sat at the rear and made a nuisance of themselves; all that hugging and kissing were a big turn-off to me. Fortunately, the turbulence came to my rescue. You see that girl in the photo? She was looking for a spare seat behind. She and her Caucasian boyfriend moved to the last row, later on during the flight. This was where my seat for today's flight. Good thing about it was empty seats beside me and at the back, it was easier to take cabin shot. Bad thing was not able to recline the seats and the seat pitch is tighter than the rows in front. Once the aircraft took off. The captain gave us some detailed information of our flight plan and told us that it was cloudy though out, nothing about the turbulence. The climb was relatively smooth except the part where we went through the clouds. It was pretty bumpy and at one point, there was a huge 'drop' which caused some children to scream but the ride was not as bad as my Peach's flight. Once we reached our assigned flight level, the seat belt sign was switch off and the crew were in action. Meanwhile, I took some photos of the toilet . 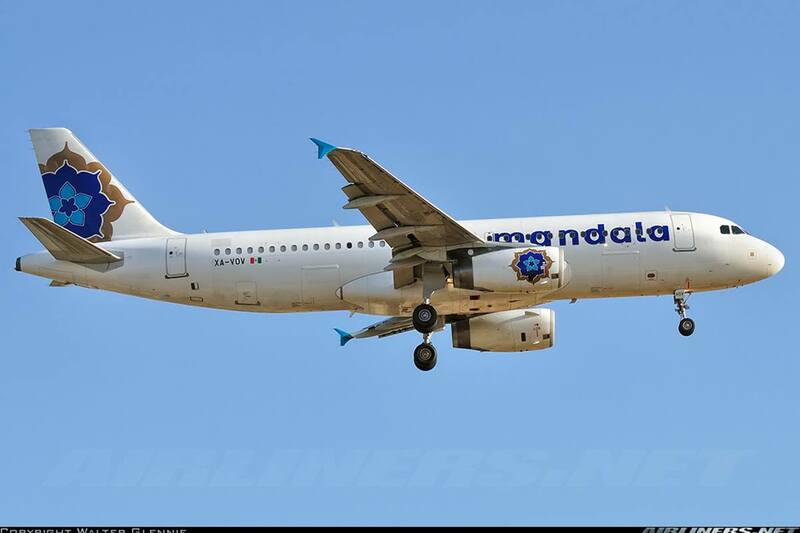 As Tiger Mandala is a low cost carrier, you have to pay for food and drinks. Nothing is free, but the price is reasonable, in fact its cheaper if you fly out of Singapore on the local (Singaporean) carriers. I pre-ordered Nasi Padang, as it was recommended by my aviation friends and seemed to be the most popular meal . The cabin crew came with my meal and did a check on my ticket but he handled my meal over to me. At that point I was really hungry, so it was a good time to enjoy it. It didn't look very appetising especially the vegetable. Tasted aright, it wasn't spicy to me but the problem was not long after the flight, I had diarrhoea when I got home. It took me about a week before I fully recovered! This was my first time I had such a problem! My only source of entertainment was this! It was a pretty nasty ride going through the clouds. At this time, the turbulence got quite intense that one of the crew sat down a few seats beside me. He looked a bit frightened and I had to calm him down. Told him that once the plane was out of the cloud, the ride would be smoother. His colleagues came by and were making fun of him, what a sight that was! Almost there now, finally the rain came in after weeks of blue sky. Landing was smooth and the touchdown was great. Landed at runway 02L and we taxied for about 10 minutes to our gate at Terminal 2 and my trip was over. Time flies when you are having fun, that's for sure! Sorry for the lack of videos, I didn't take them as the weather was pretty bad. About the in-flight service: This set of crew was average, not outstanding in any ways. Possibly one of the worst experience I had with the Indonesian carriers. This set of crew seemed inexperience. At this time, no one exactly knows the clear picture of the future of this airline. I am glad to have at least flown with this carrier at least once. I find my overall experience with this airline acceptable and will have no problem flying with this airline again in the near future, maybe I will skip the 'Nasi Padang'. 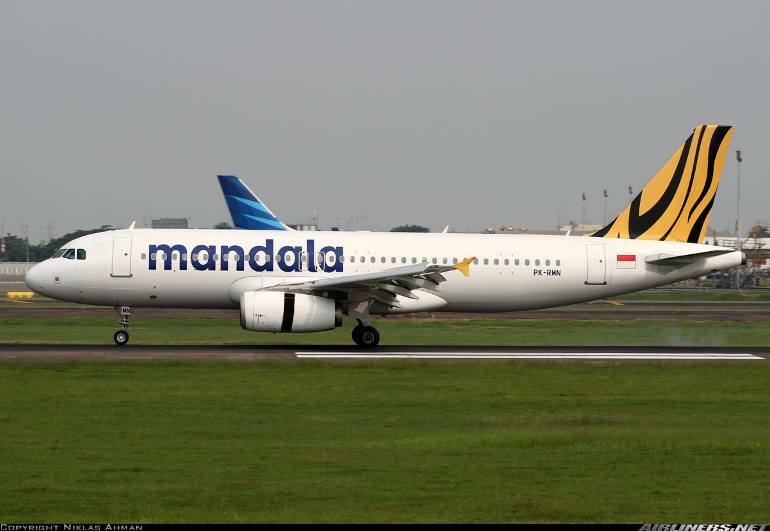 Indonesia carriers could do a lot better by improving its on-ground service. Answering their emails should be their start. I hope to see this airline doing better in the near future. The first 2 generation had something in common and that was the airline ran out of cash as they made huge losses, so hopefully this airline won't repeat history once again. Would I recommend this airline? Yes, if the airfare is right. You can trust the airline's maintenance. Comparing this to Lion Airlines, I would rather fly with this airline. If your flight gets cancel or delay, you may be transferred to Tiger Airways, so I won't worried too much about it. Thank for reading this trip report.